With his two prior releases achieving critical and mainstream success, expectations were soaring for Lupe’s latest creation. Despite being completed for the past two and a half years, “Lasers” still sat on the shelf at Atlantic Records, turning anticipation into frustration for fans. Unfortunately, even with the release of “Lasers,” fan frustration isn’t likely to subside. First, let’s get one thing straight: “Lasers” is not a bad album. But following “Food and Liquor” and “The Cool,” Lupe has set a standard that had fans expecting more of the same. However, this album is a far cry from what we’ve come to expect. Much of this can be blamed on the disputes between Atlantic Records and Lupe during the production process. “Lasers” is a prime example of what happens to an album when the record label abuses its power over the artist. “A lot of the songs that are on the album, I’m kinda neutral to,” Lupe Fiasco said himself in an interview with Complex magazine. Lupe said on most of the tracks, Atlantic Records insisted he use a pre-made hook or change certain aspects of his songs, oftentimes going in a completely different direction than intended. 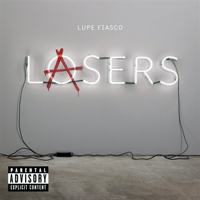 As a result, almost every song on “Lasers” features an over-produced, heavily emphasized chorus that steals the thunder from Lupe’s own verses. Even with outside influences overtaking the album, Lupe still manages to produce a few gems worthy of comparison to his previous works. “All Black Everything” is one for the “Food and Liquor” fans to enjoy, as it displays the originality and style of old that we’ve come to appreciate from Lupe Fiasco. Songs like “I Don’t Wanna Care Right Now,” “Coming Up,” and the lead single “Words I Never Said” are among the few standouts of the album. Although there are moments of greatness on “Lasers,” the unfortunate battle between artist and record label taints what could have been. Instead of another masterpiece from Lupe Fiasco, we’re left with a run-of-the-mill rap album from one of the best in the game.